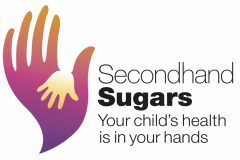 Secondhand Sugars™ is a new concept, coined by Dr. Michael Goran, that helps us to change the way we think about the way different sugars can impact developing babies in utero, infants, and children. What are Secondhand Sugars™? Secondhand Sugars™ are the sugars found in foods and beverages that babies in utero, infants, and children are exposed to. They are not choosing to consume these sugars but are affected through passive exposure on an involuntary basis. When a pregnant or breastfeeding mother eats or drinks sugars, they can be passed on to her baby either in the womb or through her breast milk. Infants and children can also be exposed to secondhand sugars in infant formulas that contain added sugar, sweetened baby foods, and sweet foods and drinks, like juices, marketed to children. Babies and young children directly consume these products but they are still passive consumers because they are too young to be able to choose non-sweet alternatives for themselves. Just like secondhand smoke contributes to cancer risk and cardiovascular risk in non-smokers, secondhand sugars are damaging to children who are not choosing to consume sugars. In addition, these damaging effects can be specific to infants and children, because these sugars can disrupt the normal processes of growth and development. How are Secondhand Sugars™ harmful? Exposing children to sugars during growth and development can have harmful effects. These effects can include problems with cognitive development and learning as well as lifelong risk for obesity and related problems like diabetes, fatty liver disease, and heart disease.